This year Princess is getting an American Girl Doll for her birthday. Lest you think I have lost my everliving frugal mind, I hasten to assure you that this is a grandmother gift. . . My mom promised Princess almost 2 years ago that when she turned 8 she would be taken in to New York City to the American Girl Store and get the whole doll/teaparty treatment. I pulled her aside when she said this. For the uninitiated, American Girl Dolls cost about $83. Buck naked. The clothes cost about $30 an outfit. . . they have more possible accessories than most adults I know. This is not something I ever would have purchased for Princess myself-just on principle. $83. For a naked doll. But grandparents have certain perogatives, so I am willing to let my mom purchase it. Now there are some ways to approach this whole American Doll phase in a more frugal manner. 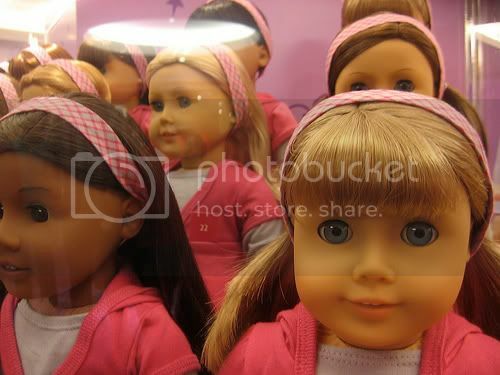 Skip the Package: If you are near a city with an American Girl Doll Store and are going to do the whole special day thing, consider ditching the “package” deal. The lowest price “package” is for one kid and one adult and costs over $200. That includes a meal, an appointment with the doll hairdresser, a special photo and $130 spending money in the store. Instead my mom booked us a meal at the restaurant ($26 each for 3 ppl-and they will set a special place for the doll at the table w/a special chair and all). We will go in a few hours before our reservation and pick out her doll, wander around the store etc. There should be plenty of opportunities to do our own snapshots-no special photo shoot needed. Knit or Crochet: If you have any skills along the knitting or crocheting lines you could make clothes for the doll at a fraction of the price. I found several free knitting patterns for 18″ doll pullovers, cardigans, hats, a poncho and even a cute muff. Likewise there are many crochet patterns. Sew some clothes: I was not able to find any free sewing patterns for them, but considering the cost of a single outfit, spending $14 for two patterns (that can make over 9 different outfits) seemed worth while to me. For less than $50 I bought enough fabric and notions to make Princess and the doll 4 matching shorts/halter top sets and a cute matching dress. That’s a big thing you know-dressing the same as your doll. . . I’ll be posting pictures soon! Search online: If you are not the DIY or crafty type, try doing a google search-you may be able to find items for sale at other shops, or on ebay for much less than they sell for in the stores. You can also try keeping your eyes out for clothes at thrift shops, garage sales and even craft shows. So there you have it, a few ideas on how to have an “American Girl” experience for less. http://www.knittingpatterncentral.com have loads of American Girl doll patterns. Also if the knock off outfits are cheap enough or you can pick up one at a yard sale you could take it apart at the seams and use it to make a sewing pattern. Ok it would be time consuming, but I nearly took a buckle when you said $30 an outfit. There are people on etsy.com who sell American Girl outfits that are handmade. MUCH less than $30 and you'd be buying handmade which is always neat. Eighty-three bucks for a naked doll? That. Is. Crazy. I mean, it’s sweet that your mom is giving that to your daughter but… wow. When I was little I had a Barbie that my mother made clothes for, which was sweet. I remember a tiny faux fur coat that I loved. do they come naked? back in 1992 when i got mine (i paid half, mom matched what i saved for it – i was 7) it at least came with one outfit. then i saved up my allowance and bought one additional outfit at a time. many of those outfits are discontinued now and sell on ebay for big bucks so overall i think it was a good investment. however, my american girl doll is one of my few childhood toys i’m hanging on to. Michaels craft store, and maybe Hobby Lobby, sell clothes to fit them. You can use a 40% off coupon. Thankd for the great ideas! We opted for an “Our Generation” doll from Target and an outfit from the AG store. She looks like Molly at a fraction of the price. Also sign up for e-mails from AG and check out their sales. When they mark stuff down, they really mark it down. But hop on it, it sells out quickly. I just finished reading your blog and went to another favorite one of mine who happened to post this website with free patterns for American Girl doll clothes. I was the proud owner of one such doll when I was younger and it was my most prized possession. I hope your daughter enjoys it just as much! American Girl has online sales a few times a year . I have been able to get doll and girls matching outfits for less than the cost of one doll outfit full retail . Okay, well people are right that the Target brand has some affordable alternatives. But I heard a rumor that the brand is going under? Perhaps it was wrong. The actual patterns for various dresses (at least the historical ones) can often be found on the fan message boards. I’d suggest checking there. And lots of people, of course, make doll clothes. It’s just a matter of sorting through what there is that you like. I wasn’t even aware they sold AG naked. I know that, if you buy a doll, you can return the outfit the doll comes in for a credit. Otherwise they’re $90. I’m glad she’s getting the doll she wants. I know they’re expensive. But if you hit the sales you can sometimes nab a deal. That and eBay auctions on Sunday are often underpriced. My daughter has had an American Girl doll for the last year and it was $100 well spent. I, too, cringed at the cost. But in the end that doll has withstood a serious “loving” from my 5 year old. She takes her everywhere. Drags her around and she still looks as good as the day we bought her. So if you have a daughter who really loves dolls I say buy one. Wow, when did they start selling them naked? My daughter (now a teenager) got hers about 10 years ago and it was fully dressed. For clothing patterns, check when JoAnn’s has their pattern sales. Simplicity and McCalls used to have quite a few patterns for dolls like these. Also check eBay. Back in the “olden” days, when these dolls first came out, American Girls had patterns that you could buy for doll clothes. As for the “naked” thing-I don’t know if they will let you out of the store without buying a set of clothing in conjunction with the doll, but on the website I think that there is a baseline price for the “just like you” dolls, and then the price of the outfits vary. Found your blog. We are a company of 3 women with 6 daughters amongst us and untold # of nieces and girl friends nieces! We started a company offering “off-brand” items for American Girl Dolls and we are actually now making a living at it after 2 years! We feel your pain for the prices and appreciate your blog entry. I normally don’t leave messages but thought I would liet you know about a new “link” idea we started that can help you. We do have a “link referral program” that provides commission to referring site/blog owners for orders generated as a result of the link to our site. Your members would receive a 10% discount off our published prices by using a promotion code (that would likely be your site name). You receive a monthly commission of 10% for all orders generated using your code. I am happy to discuss this with you further. Please check out our site and our blog. We certainly would link your website as well! This program is a win for all. Hi there – these dolls have never been sold naked. They have crept up in price from around $75 in 1986 to $95 now – always clothed. You can return the meet outfit for a partial refund, but they’ve never forced you to make another purchase due to the doll coming naked. There’s no comparison between American Girl and the knock offs in terms of quality. It really depends on how much the child wants the doll. If she’ll remember forever the doll she didn’t get, then cut out something else or several other things are that optional, and buy the doll. Supplement with inexpensive handmade clothes as suggested. Skip the expensive trip to the city for the experiential retail. A $1000 play doll for a child would be insane, but $100 for a doll that will last an entire childhood (provided she really wants a doll)? Worth it. I think what a lot of people are missing here is that these dolls are very well made as are their clothing and accessories. Also they do not sell them naked and a MYAG doll is 105.00. Yes the outfits are around 30.00 a pop. Some more some a little less. There is no comparison to the quality of AG dolls to the off brand 18 inch dolls. My dd has several AG dolls and they have afforded her hours upon hours of imaginative play. It is money well spent. Melly-They are very well made-and Princess has loved hers. For some folks though $105 for a doll is just not in the budget, even if the doll itself is worth the money. In that case many folks do choose to purchase a less well made doll that is somewhat similar. I think each person has to make these choices based on their budget and their own needs. Although this is an old site. 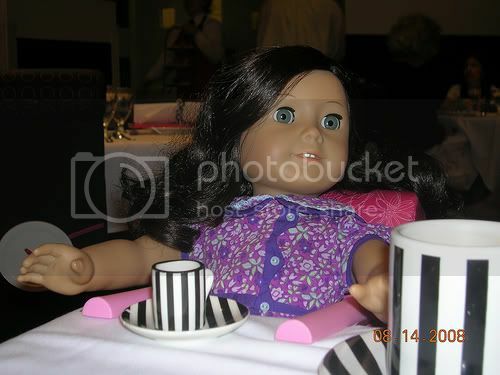 I want to add that if your daughter has her heart set on an American Girl doll, check Craig’s list and ebay for one. I have bought some has cheap has $20 at thrift stores and garage sales. Even if the hair is a mess, you can send them to the American Girl Doll hospital and have them rewigged. If you didn’t spend too much on the doll you would still come out cheaper than buying one new. Two years ago I bought my first one for $5. in terrible shape at a thrift store. I learned from tutorials on line how to restring and rewig her myself. I buy, repair, sell/give them away and collect them now. I make clothes for them and teach little girls how to make clothes for them. I am still getting new ideas from people on the web all the time. I think they are much better made than the knock-offs (Though I own a few of those too.) If you are going to invest in an American Girl Doll watch some of the tutorials on Youtube. The doll could be something passed on to other generations. PS. I’m 61 years old. Great tips Rebecca! And don’t worry about it being an old post–just as you found it others will eventually. My daughter still takes very good care of her doll–and they are great quality–but I’m glad that the “knock offs” are out there for families who don’t have the budget for the original.